I’m dropping this handsome fellow off at Mama Ganache Artisan Chocolates, where they’ll be having an all-cat art show for the months of April and May. Featuring work by John Landon, Lin Mercer, Charmaine Coimbra, Cynthia Meyer, Jo Jackson, Paula Schroeder, Rochelle Niemerow, Linda Bergsma, and others. Show runs April and May, 2017. 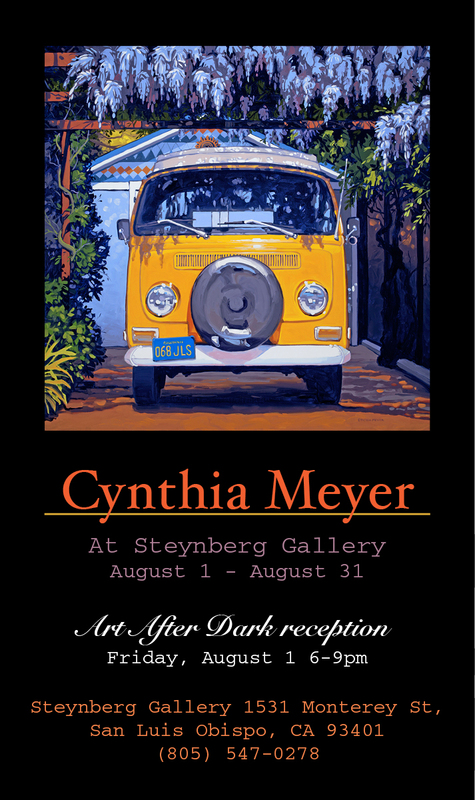 I’m having an art show, August at Steynberg Gallery! NOTE: The show has ended. Big thanks to all who came and made it a great event! Check availability on a piece you saw at the show: Just What’s Available. Or scroll through the entire portfolio: The Entire Portfolio. 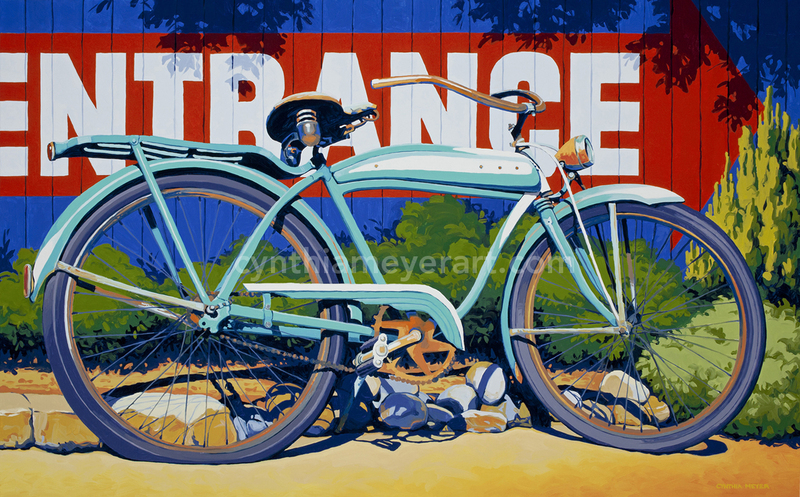 This show is a little bit of everything that makes me happy: bicycles, local buildings, flowers and other colorful things. Stop by and say hello at the reception! 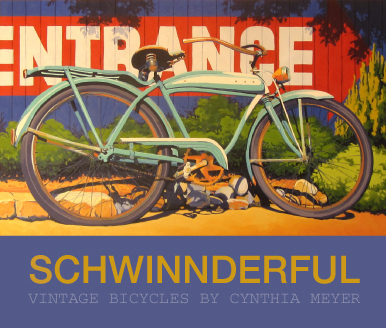 Schwinnderful: an entire show of bicycle paintings. 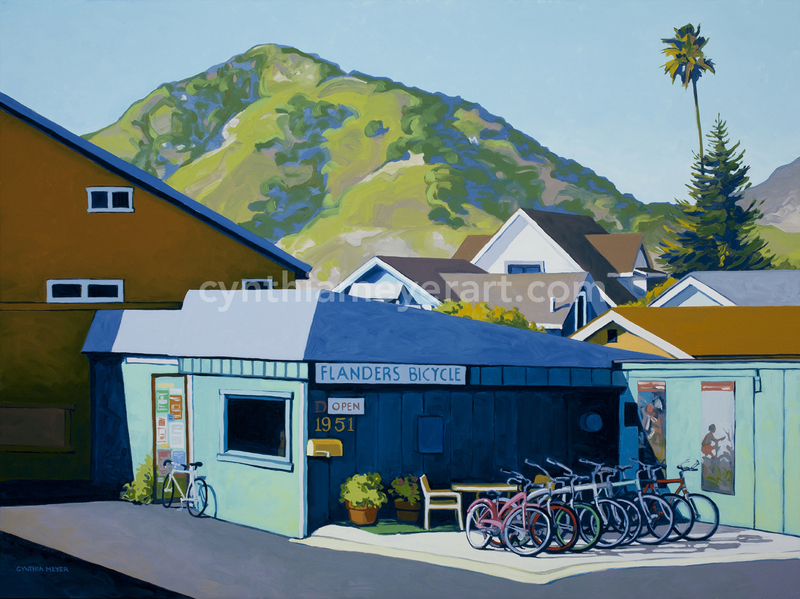 Come see my new show at The San Luis Obispo Museum Of Art. This collection is all about bicycles: everything from your grandpa’s skiptooth to stingrays and more modern frames. The show runs April 5th through April 28th. I’ll be there Friday April 5th from 6 to 9, during Art After Dark. 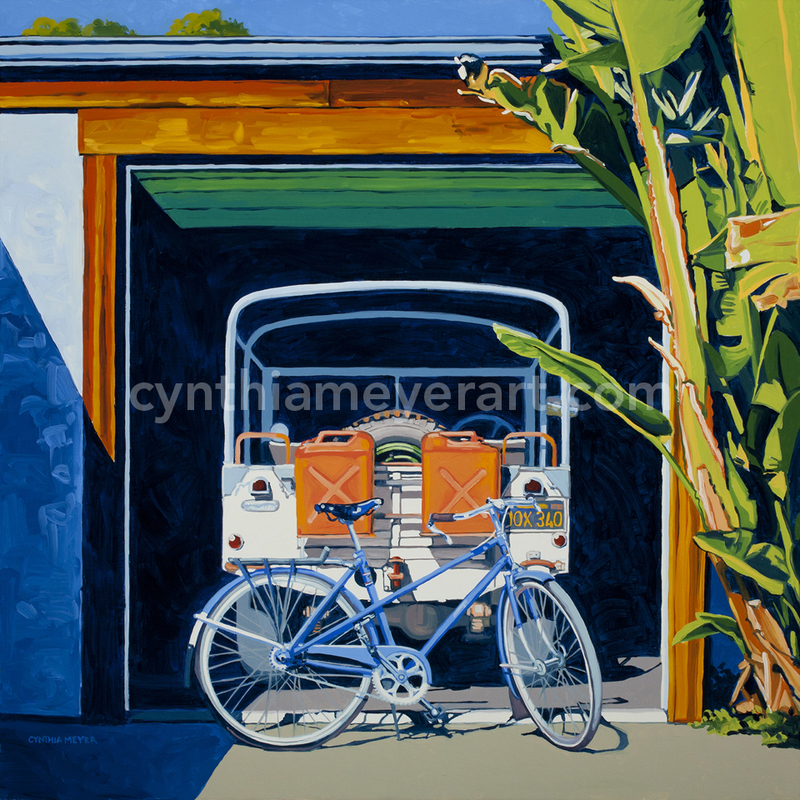 Stop by, see the paintings, and share a glass of wine! These are the paintings that are on display. If you are interested in a painting, please click here to contact me. A lovely turquoise balloon tire bicycle, showing years of wear. 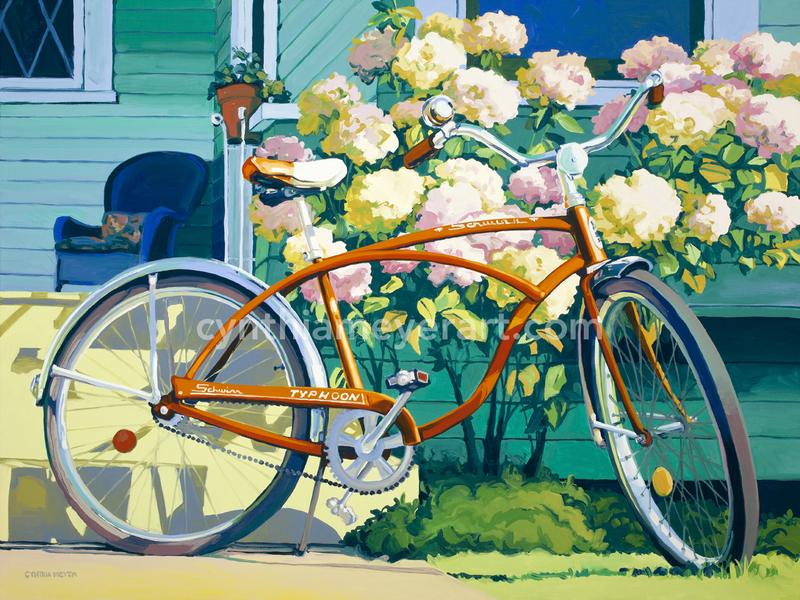 A vintage Schwinn Typhoon bicycle, in front of my Mom’s hydrangeas. 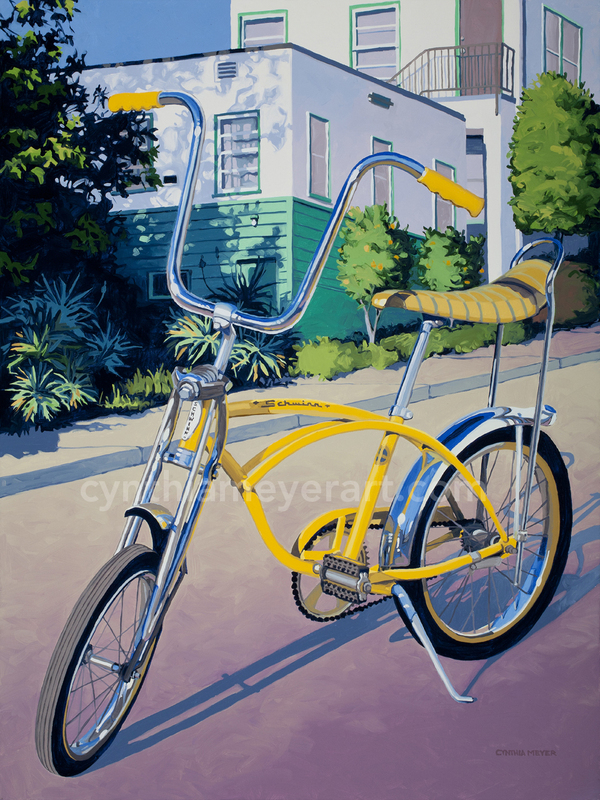 A vintage Schwinn Lemon Peeler bicycle in front of old deco apartments. 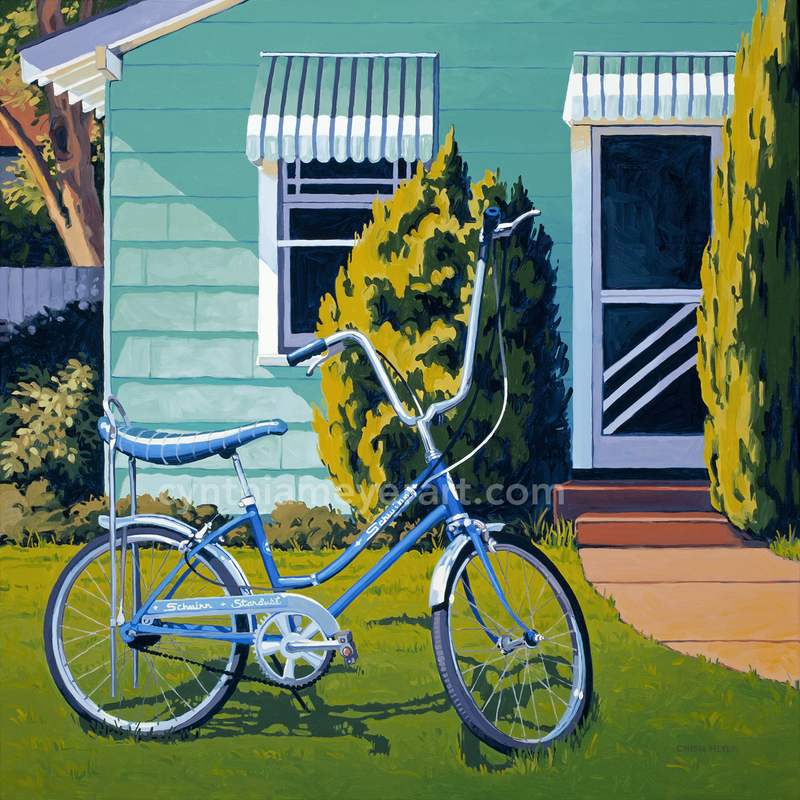 A blue Schwinn Stardust bike on the lawn. 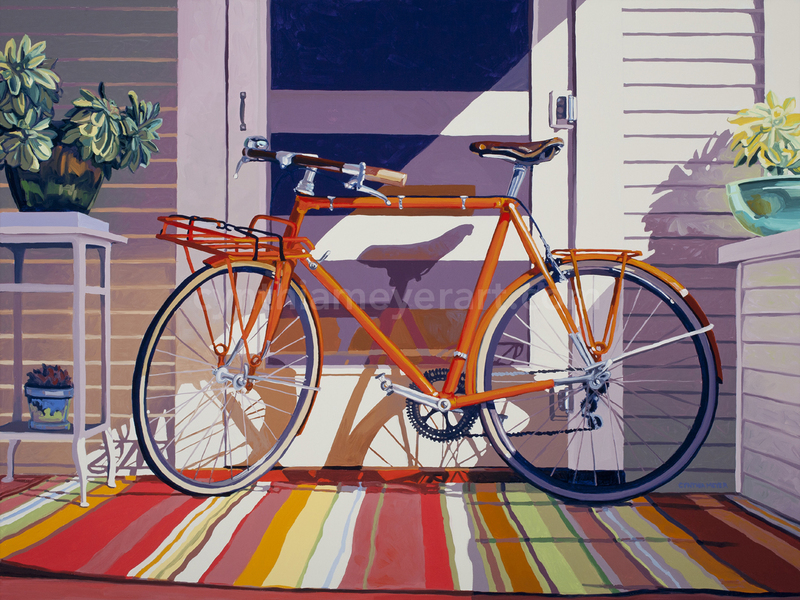 My husband’s orange Atala touring bicycle, on the front porch. 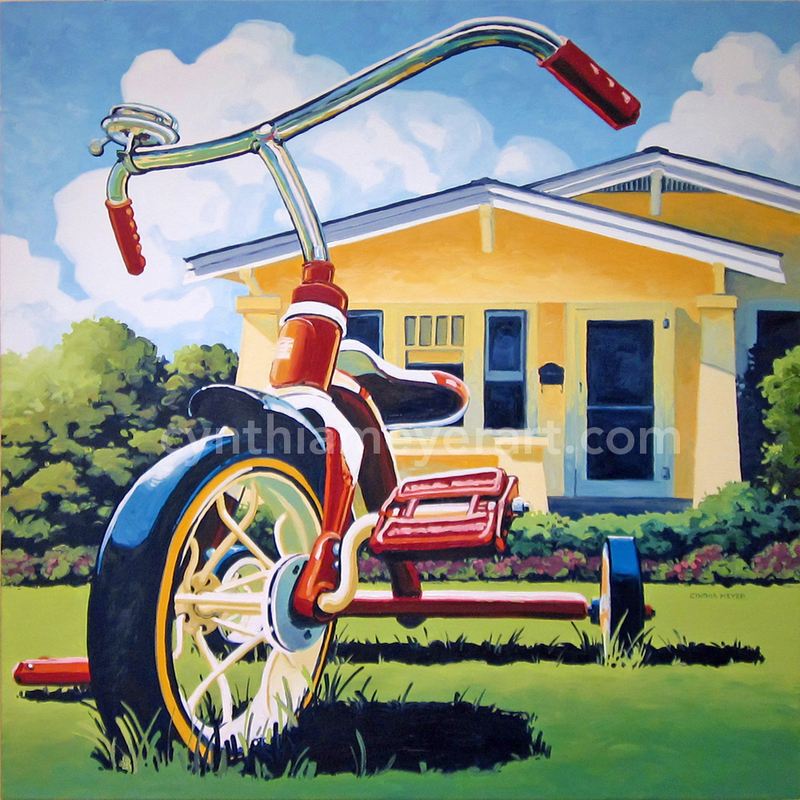 A vintage red tricycle on the front lawn. It must be nap time. A nice blue balloon tire bicycle with leather panniers. 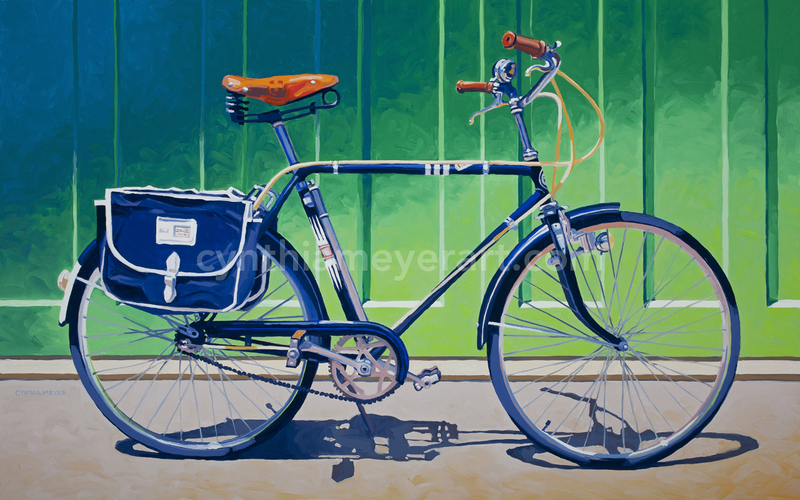 A great three speed bike with vintage vinyl panniers. The local bike shop in San Luis Obispo. 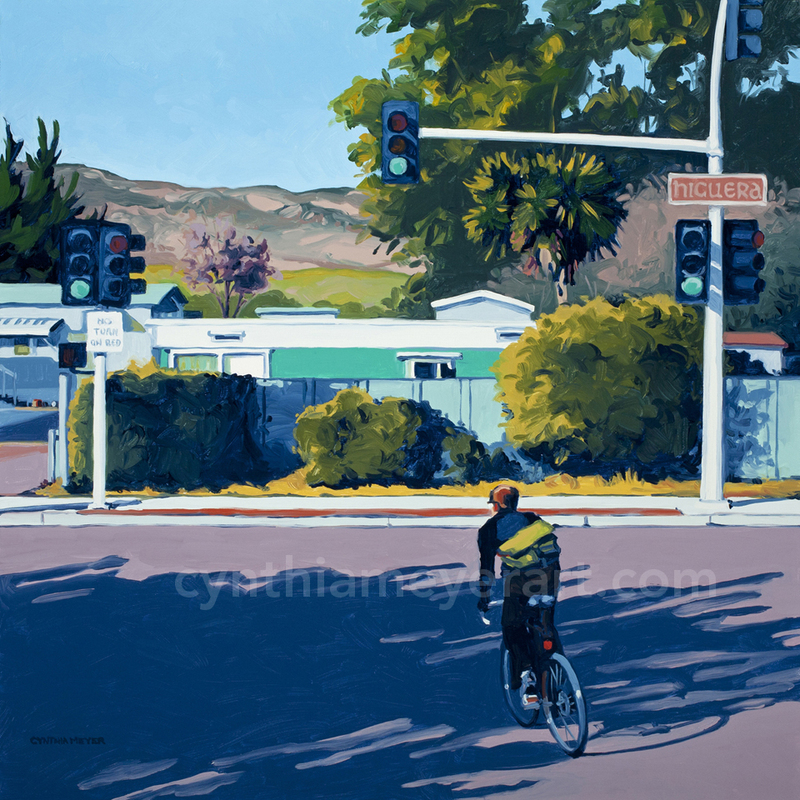 Cycling past the trailer park in San Luis Obispo. 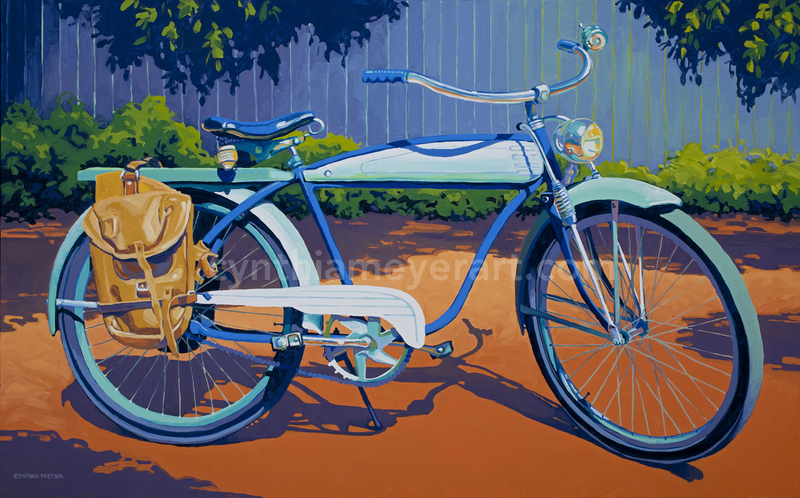 My blue mixte bike with Eric’s Dad’s 1952 Land Rover. © Cynthia Meyer. All rights reserved.